Use brightness and volume control for DVDs, streaming video and other screen applications by interfacing with BioExplorer. No need to use BioExplorer’s DVD player! For Windows machines or Mac with Boot Camp. Does not work with Mac Parallels. BxShadow For BioExplorer is a small stand alone application that communicates with BioExplorer through the server element. It creates a shadow box that you can control and that is linked to BioExplorer’s feedback. You can adjust the brightness settings and choose to have high/low brightness levels that switch back and forth, or variable brightness with gradation. You can size and place this box over a whole screen or anything on it–not just a BioExplorer window. 1. Instead of using the DVD player in BE, use your standard DVD player and place the shadow window over it. The DVD will play in Windows…but the shadow will adjust the brightness based on what the client is doing in their training design. Sound is also adjusted based on the feedback. 2. Stream a video of interest to the client on your computer, and have the brightness and volume controls adjust its brightness and volume. 3. Download a game like Tetris or another that the client enjoys and place the shadow window over that on the client screen (no need for the BioExplorer window even to be there! ), and the game brightens and darkens and volume of game sounds change based on brain performance. 4. Open a Kindle book or a digital graphic novel on the screen and place the shadow window over that so reading becomes easier or harder to follow based on what the brain is doing. 5. Surf the net on your favorite browser with the shadow window over it. Use your imagination! The program makes whatever is on the screen under the shadow window a part of the training. The install package comes with two sample designs that show how the server element should be set up. One design does discrete bright/dark feedback, the other has a gradual dimming of the display. 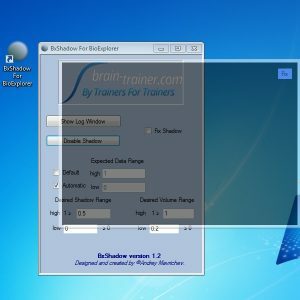 The brain-trainer design package has been updated to include BxShadow as a feedback option. RETURNS POLICY: BxShadow is not returnable. We have been using Bxshadow for several years and the program has worked flawlessly from the start. We see that the clients are happy to choose what they watch and this improved compliance and clinical outcomes.